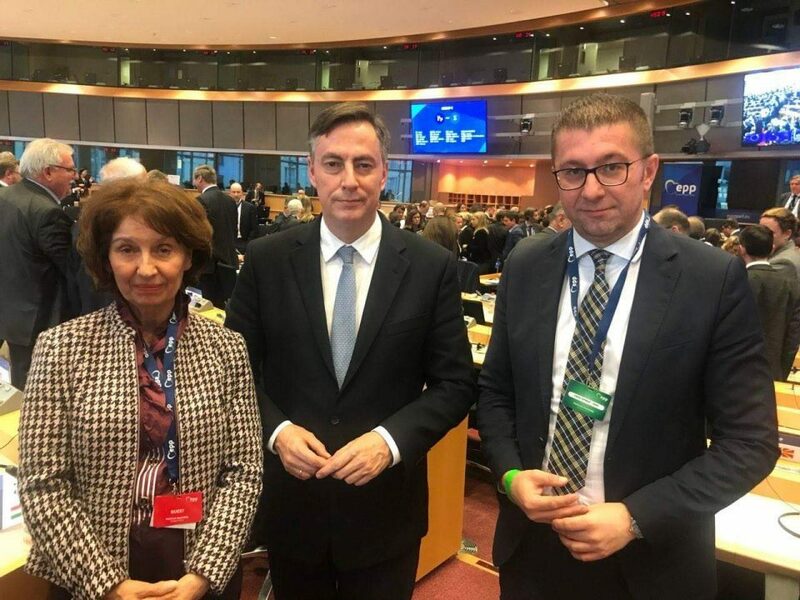 VMRO-DPMNE leader Hristijan Mickoski, together with presidential candidate, Gordana Siljanovska Davkova, VMRO-DPMNE vice-president Aleksandar Nikoloski and the secretary for international cooperation Timco Mucunski continued Thursday their working visit to Brussels. During the course of the day, Mickoski and Siljanovska Davkova met with Horst Heitz Executive Director of the SME Europe, an organization for small and medium-sized enterprises, representing over 400 thousand companies from Europe. Mickoski discussed exchanging experience and information regarding the development of a quality economic program that will offer solutions for companies in Macedonia as well as plans to attract businesses in Macedonia through competitiveness of the economy and enabling a favorable business environment. We regularly communicate with Macedonian companies and I can say that I am well informed about the shortcomings in the business sector and the problems that they face. Unfortunately, we cannot boast of good business opportunities in the country, and raised taxes and administrative barriers are doing their part. Citizens grow more dissatisfied, and this is an indicator that economic overhaul is needed. Macedonia has huge potential that must be used, and I see the future by supporting domestic business and networking and good business cooperation with European and global companies. The economy will be our most important priority and it will bring a better life for the citizens, said Mickoski. Gordana Siljanovska Davkova pointed out that law and legal state are needed for a functioning economy, and that although the Republic of Macedonia has serious issues in this regard, things can change. The economy is most important for Macedonian citizens and therefore a significant part in the presidential program will be dedicated to economic diplomacy in order to improve the lives of citizens, said Siljanovska Davkova. The VMRO-DPMNE delegation also met with Javier Hurtado Mira, president of the Democrat Youth Community of Europe. At the meeting, the possibilities for cooperation and the main challenges of the youth in Macedonia and Europe were discussed. Siljanovska Davkova said that one of her priorities will be the support of young people. All forces should concentrate, everything with knowledge in the Republic of Macedonia to gather and to provide them conditions for development . We need to rely on our own capacities so that Macedonia can truly become a decent European country, said Siljanovska Davkova.